On June 14 in Russia starts the FIFA World Cup. The day before the concert in Moscow dedicated to this event took place on the Red Square. 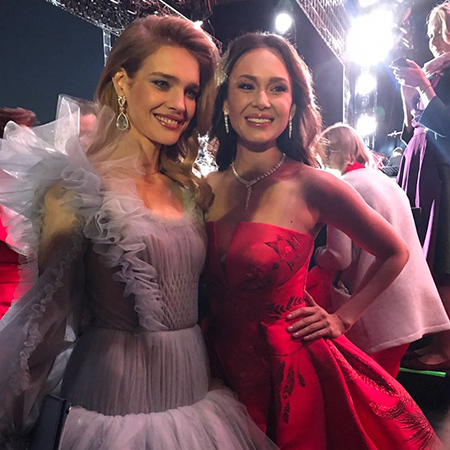 The concert was conducted by the model Natalia Vodianova and pianist Denis Matsuev. The 36-year-old supermodel appeared on stage in a soft blue tulle dress with a hand-made applique by Ulyana Sergeenko Couture. Vodianova's fans compared her with Cinderella and the Swan Princess. Anna Netrebko , Yusif Eyvazov , Placido Domingo , Denis Matsuev, Ildar Abdrazakov, Albina Shagimuratova, Aida Garifullina, Juan Diego Flores and the Mariinsky Theater Symphony Orchestra under Valery Gergiev took part in the concert. All performers appeared on stage twice, and in the end of the concert Anna Netrebko danced by "Kalinka-Malinka" with Ildar Abdrazakov.